These are only a few near death experiences endured by Smith . There are many more which I hope to add in the future. He was likely angered because the attention popular Captain John Smith was getting on the voyage over. and he aimed it at Smith …. 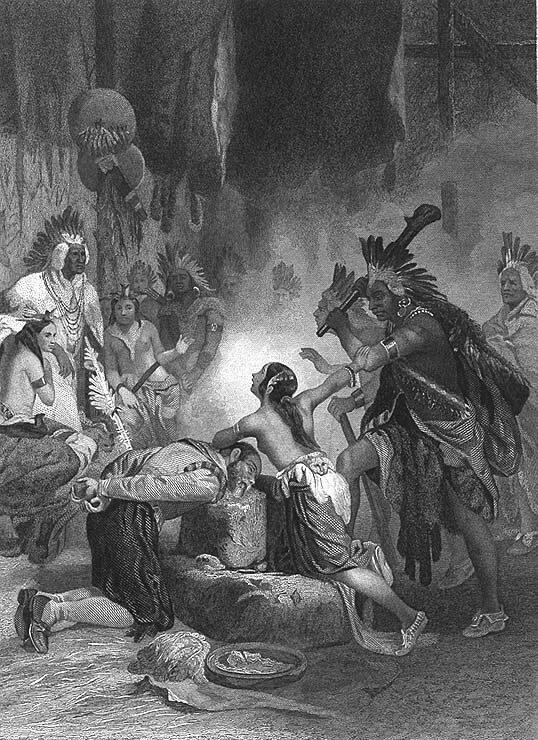 the Chief then pulled Smith into the water attempting to drown him. But Smith got the big Chief in a headlock and drew his big Turkish simitar which he came to appreciawhen fighting the Turks some 6 years earlier. Captain Smith spared the Chief’s life’. Smith waded in the shallow water. Smith was stung by a sting ray. The barb in the ray’s lashing tail pierced his arm. Smith got so very sick, thinking he would not survive this …his men dug him a grave. But a doctor applied heat to the wound and by this Smith was saved. Feeling better that evening, he ate the stingray for supper that night. That is the name of that point in the Bay today. (But not to Jamestown )! he mapped the northern part of this new world and named it “New England“. This event started several weeks earlier , first week in December 1607.
when 200 Indian warrriors ambushed Smith and shot arrows at him. surrounded, and wounded in his leg. captive, and at their mercies, ….what can he do? He was taken before the leader Chief Opchanacanough to whom he gave his compass. Tto test Smith’s bravery, Smith was tied to a tree. if Smith screamed they would surely kill him. 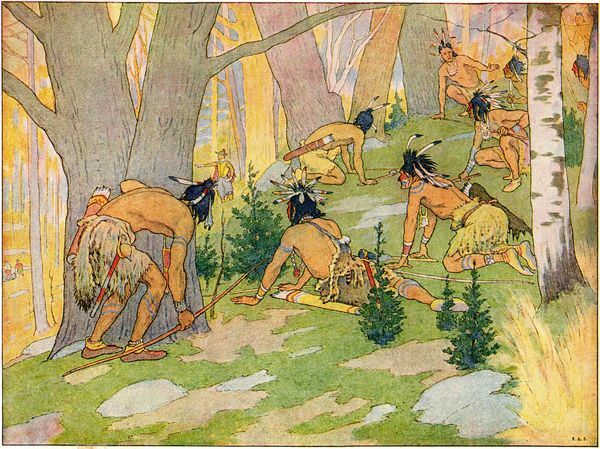 But brave Smith did not scream and passed the Indian’s test. Smith was paraded through a dozen villages for weeks. other came out with clubs to break his bones. appeared at Smith’s side as if an angel from heaven. She cradled his head in her arms before the warriors struck. if you read Smith’s writings enough to know him, you will know it is true too. 1st by the feared Massawomeke Indians, then Rappahannock Indians twice, then by the Hasinnigas Indians , then a Nansemond Indian ambush. ….Smith’s arch enemy and troublemaker Ratcliff, when president of the council, (mouthpiece for Archer, Ratcliff’s cohort troublemaker), accuses Smith of being responsible for the loss of some men when he was ambushed by Indians on the Chickahominy expidition. Smith was put under arrest and scheduled to be hanged the next day. …. Smith is aboard ship in a cabin terribly burned from his accident. In comes a couple of the individuals that were primary trouble makers at Jamestown with pistols to kill Smith. good luck and happy reading . Please consider leaving a comment below about this page . Thanks in advance.